Title Banner: Photo of pro-Treaty Cumann na mBan members in Cork during the Irish Civil War. Within Cork city, eight out of twelve Cumann na mBan branches supported the Free Sate. The pro-Treaty women’s organization was known by two names: Cumann na Saoirse and National Cumann na mBan. Déanann an taispeántas seo doiciméadú ar scéalta ceilte na mban a ghlac pairt i gCumann na mBan agus gluaiseacht Cleachtadh an Chirt Vótála sa Mhumhan. D’fhásamar suas gan tuiscint iomlán againn ar cad a spreag na mná seo, agus cén fáth go ndearna an pholaitíocht agus an chinsireacht beag is fiú dá n-iarrachtaí. Déanann an taispeántas seo doiciméadú ar ghiota de shaol na mban seo. Cuireann sé tús tá súil againn le comhrá poiblí a thugann urraim do scéalta laethúla “Mná an Deiscirt”. This exhibition documents the hidden stories of women who played a part in both Cumann Na mBan and the Franchise movement in Munster. We grew up without fully understanding the motivation of these women, or why politics and history downplayed and censored their contributions. This installation documents a portion of these women’s lives. 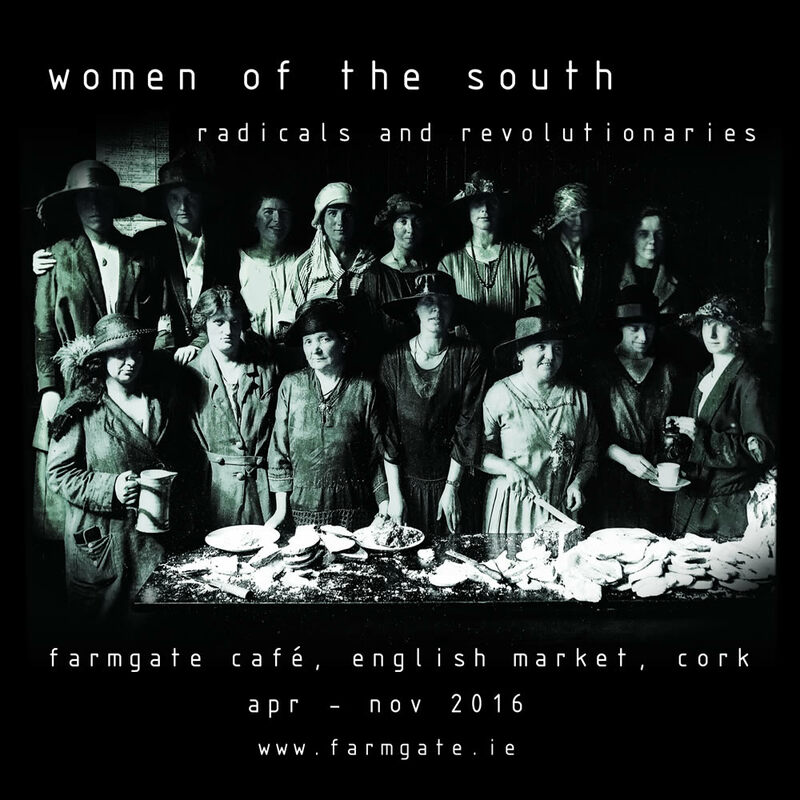 It hopefully marks the beginning of a public conversation honouring the everyday stories of “Women of the South”. Kathleen Daly Clarke was a dress maker and a small shop owner. Born in 1878 and raised in Limerick by a prominent republican family, she married the Fenian leader Tom Clarke in New York. In 1907, the couple took up residence in Dublin, where Tom Clarke planned the 1916 Easter Rising. After the Easter Rising and the execution of her husband and brother Ned Daly, Kathleen Clarke helped re-organise the shattered republican movement. Clarke was a founder and vice-president of Cumann na mBan. When Sinn Féin was relaunched in 1917, she served on its executive and helped secure women’s equality within the organisation. Clarke was imprisoned in 1918, but remained a top political leader throughout the War of Independence. Like many women in the movement, she maintained multiple roles: Dublin Corporation Councillor; Board member of Harcourt Street Children’s Hospital; Schools Meal Committee member; District Judge on the Dáil Eireann Courts; and co-founder of the Irish White Cross. Clarke also managed to raise three children during the revolution. She was elected to the Second Dáil in 1921, but lost her seat in 1922 after she opposed the Anglo-Irish Treaty. Clarke was re-elected in 1927, and then served in the senate from 1928 to 1936. Though she co-founded Fianna Fáil, she ultimately left the party after clashing with Eamon de Valera. In 1938, she became the first female Lord Mayor of Dublin. Throughout her political career, she fought on behalf of women, most notably in campaigns against gender restrictions on employment and for equal pay and the rights of single mothers. Kathleen Clarke died in 1972 at the age of 94. Mary MacSwiney was born in London in 1872, but raised in Cork. She lost her foot at a young age. A number of her siblings were active in the independence movement, including her brother Terence, who died on hunger strike in 1920. During the early years of the century between teaching jobs in England, Mary featured in Cork separatist circles, especially the Gaelic League, experimental theatre, and early Sinn Féin. She also co-founded the Munster Women’s Franchise League. As a mature student, she received a teaching diploma from Cambridge University and a BA in Arts from University College Cork. A co-founder of the Cork Cumann na mBan, Mary was briefly arrested after the Easter Rising by British troops at St. Angela’s Ursuline convent school in Cork. The Ursuline nuns dismissed her, but MacSwiney promptly opened her own school, the celebrated Scoil Íta on Wellington Road. During the War of Independence Mary MacSwiney was one of the republican’s most effective public speakers, and became known internationally after a successful lecture tour in the United States during 1921. She was elected to the Second Dáil in May 1921, in a seat that Sinn Féin allocated to Cumann na mban. MacSwiney vehemently opposed the Anglo-Irish Treaty, and spoke for three hours without notes during the Treaty debates. In the Irish Civil War, she was jailed twice for her republican activities, and undertook two long hunger strikes. She was a TD from 1921 to 1927, and helped lead Sinn Féin after its 1926 split with Fianna Fáil. Mary MacSwiney still refused to recognise the Irish Free State at the time of her death in 1942. May Conlon was born in 1883, the daughter of a pipe fitter in Murphy’s brewery. She grew up on Blarney Street, in a politically active family. Her brother Seán was a leading figure in the Cork Gaelic League and early Sinn Fein, while her sisters were involved in Cumann na mBan. May Conlon trained as a secretary at the Cork School of Commerce, acted in republican theatre productions, and helped establish the Cork Cumann na mBan. During the War of Independence, she served as secretary to the Cumann na mBan Shandon Branch, and secretary to the Cork District Council, which governed the various Cumann na mBan branches in the Cork city district. In 1919, May and five other Cork Cumann na mBan members were jailed for one month for collecting republican funds without a permit. They refused to recognise the court; disrupted its proceedings by singing and turning their back on the judge; and were accompanied from the Bridewell to Cork Women’s Prison in Sunday’s Well by throngs of female supporters. May took the Pro-Treaty side during the Civil War and helped lead Cumann na Saoirse, the Pro-Treaty version of Cumann na mBan. She was devoutly Catholic, and in her later years focused on raising funds for the African Missions. May Conlon died in 1946. In 1969, her sister Lil Conlon published the first history of Cumann na mBan (Cumann na mBan and the Women of Ireland, 1913-25), which was largely dedicated to the memory of her sister. Hanna [Johanna] Sheehy was born in Kanturk in 1877, the daughter of Irish Parliamentary Party MP David Sheehy and his wife Bessie. She grew up in a political household. Her father served a number of prison sentences during the Land War and her Uncle Fr. Eugene Sheehy, to whom she was close, supported both the Land League and Ladies’ Land League and served a prison sentence in 1881. Hanna graduated from the Royal University in 1902 with a first-class MA (and the poster in our exhibition shows her in her graduation robes). In 1903 she married Frank Sheehy and they made a statement of equality by amalgamating their names to become the Sheehy Skeffingtons. In 1908, frustrated by the lack of progress on women’s suffrage and by the conservative methods of the Irish Women’s Suffrage and Local Government Association, Hanna and Frank Sheehy Skeffington and Margaret and James Cousins established the Irish Women’s Franchise League (IWFL), a suffragist organisation prepared to use militant tactics. 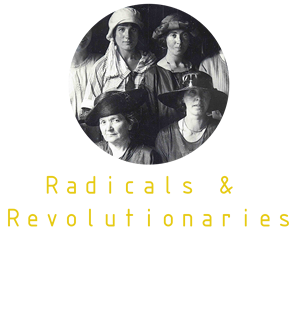 They developed good contacts with international suffragist organisations and the IWFL lobbied politicians and organised meetings across the country addressed by major figures in the women’s movement, including activists from Britain, Australia and Norway. In 1910 they hosted Emmeline Pankhurst at meetings in Cork and Dublin. Hanna made clear that IWFL militancy was directed against property rather than people. In June 1912, after the failure of a Bill designed to deliver parliamentary votes to women property owners and the publication of the Home Rule Bill without an anticipated clause giving women the vote, Hanna was sentenced to a month in Mountjoy after breaking windows in Ship Street Barracks, Dublin Castle – property of the War Office. She spent the last week of her imprisonment on hunger-strike. Imprisoned again in December 1913 – charged with assaulting a policeman who had clearly assaulted her – she again went on hunger strike. She was released after 3 days when her health deteriorated quickly and she was immediately dismissed from her job as a German teacher in Rathmines School of Commerce. Cork signatories of a petition of protest at her dismissal included Susanne Day; Nellie Forrest BA; Kitty M Cahill; Cait Ni Ceasbheall; VF Tottenham (Mallow); Alice M Miskill; Eibhlis Ni Caisil; Daisy Prendergast; M Murphy; Agnes Duncan; and Mary Curtin (names as published in Irish Citizen 18 January 1914). A pacifist, she wrote of suffragist militancy: ‘desperate diseases need desperate remedies.’ From August 1914 she spoke out strongly against war and its impacts, particularly highlighting its effects on women and arguing that it was essential that women kept their focus on obtaining the vote. As demonstrated in the columns of the Irish Citizen, the feminist journal edited by her husband Frank Sheehy Skeffington and James Cousins, Hanna and her contemporaries in the women’s movement were deeply concerned about a range of social problems. In 1911 she joined the Irish Women Workers’ Union at its inauguration and she assisted Constance Markievicz in soup kitchens during the 1913 lockout. In the 1930s she recalled how James Connolly had influenced her views on equal pay and equal opportunities for women as well as men. Sinn Fein invited Hanna to stand as a candidate in the 1918 general election when, for the first time, women over 30 had the right to vote. She declined that nomination but was elected a Sinn Fein member of Dublin City Council in 1919 and was Sinn Fein Director of Organisation during the Truce in 1921. She made it clear that membership of Cumainn was to be open equally to women and men. She was a founding member of Fianna Fail in 1926 and served on the party’s Ard Comhairle. She took a more independent political position after Fiannal Fail entered government in 1932 and was free to focus on feminist issues. Hanna was involved in a huge number of political organisations – more than can be summarised in this short account. In the decades after independence she became a Vice-President of the Women’s International League for Peace and Freedom and in 1930 she was a member of a Friends of the Soviet Union delegation to Leningrad and Moscow. She was also involved in the Irish Women Citizens and Local Government Association. Letters in state files indicate that after 1922 this organisation, with other groups such as the Irish Women Workers’ Union, constantly lobbied politicians on issues of concern to women. She would go on to oppose the1935 Conditions of Employment Bill – with its restrictions on women’s employment – and the proposed clauses on women in the 1937 Constitution. She supported a women’s political organisation that emerged that year, the Women’s Social and Progressive League (later the Women’s Social and Political League). It was formed to give women (who made up more than half the population) an effective way to use their votes: to ‘promote and protect the political, social and economic status of women’ and to ‘further their work and usefulness as citizens’: words that also sum up the focus of Hanna’s long political life. She stood as an independent candidate supported by the League in the 1943 election – in an Ireland that, as a result of the efforts of the Catholic Church and state, had turned its back on the radicalism of the early twentieth century and become deeply conservative. She was not elected.